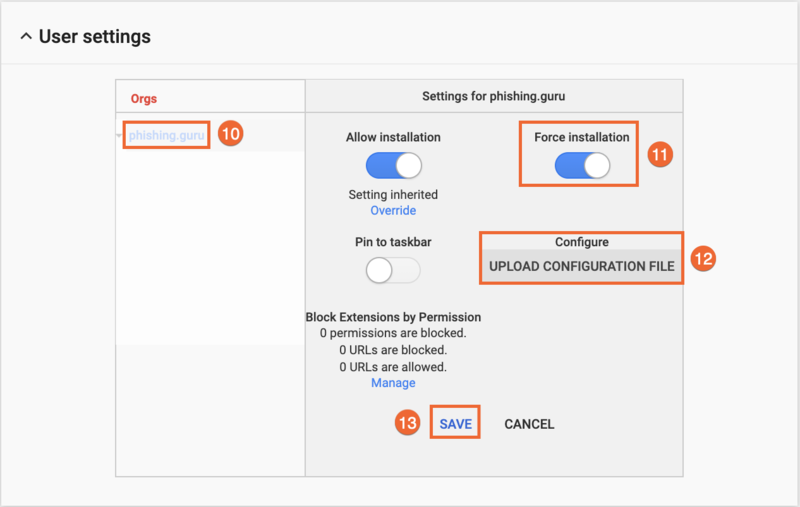 The Phish Alert Button Chrome Extension for Google Apps/G Suite gives your end-users the ability to report suspicious emails and empowers your employees to take an active role in managing the problem of phishing and other types of malicious emails. The tool can also provide your IT or risk management team with early warning of possible phishing attacks or malicious emails so they may take timely and effective actions to prevent security breaches or network compromise. The Chrome browser extension can be installed on Windows/Mac/Linux and Chrome operating systems managed by G Suite (mobile version of Chrome is not supported). End users must be logged in to Google Chrome and their Gmail account. Administrative rights to your organization's Google Apps/G Suite account, with Chrome Management turned on for your domain/OU. The URL and ID for the PAB Chrome Extension. 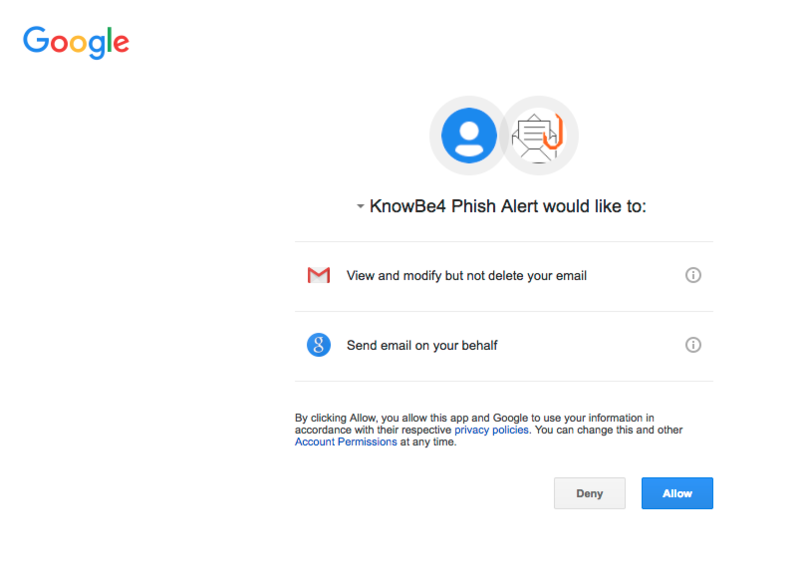 Step 1: Log in to your KnowBe4 account and download the phish_alert_configuration.json file from your Account Settings. You will need this file for installation. 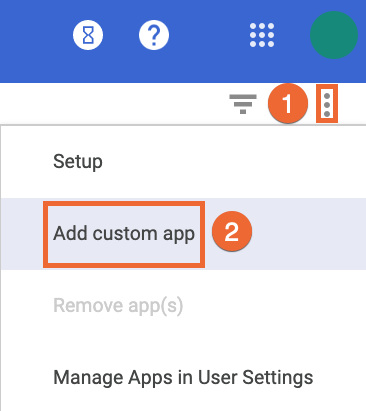 Step 2: Ensure you're logged in as an Admin to your organization's Google Apps/G Suite account. When you're in Gmail, you can click on the top-right button (shown below) to access your Admin area. Click the Google Apps icon in your Gmail account to find your Admin area. 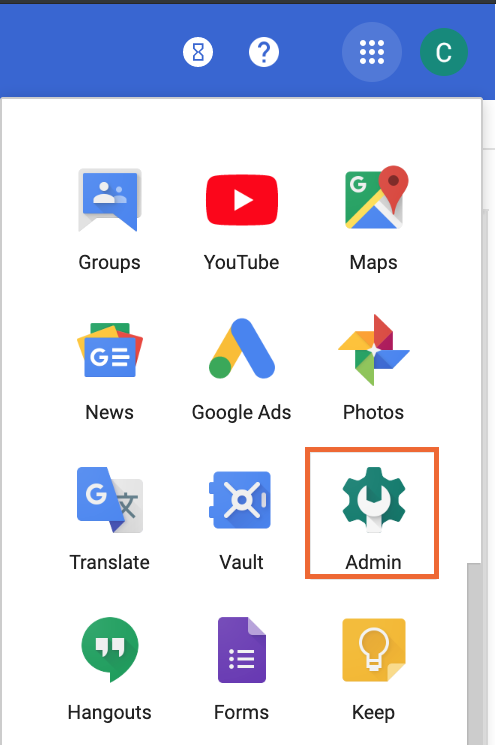 Step 3: Click the Admin icon to access your G Suite Admin area. Step 4: Click Device Management. Step 5: Click Chrome Management. Make sure Chrome Management is ON for everyone. 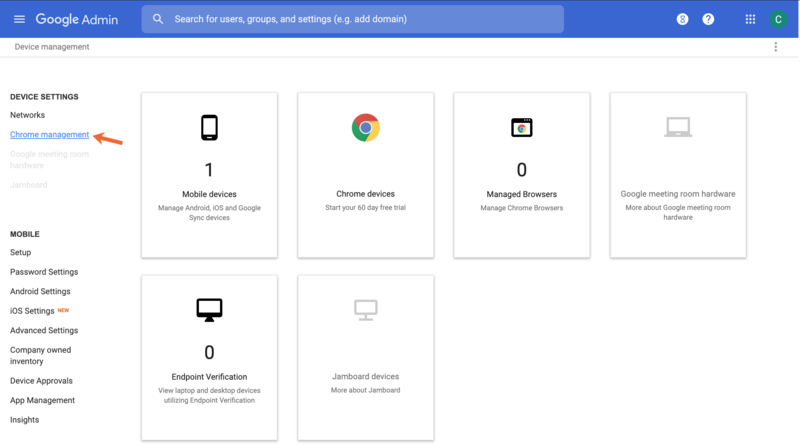 Step 6: Ensure Chrome Management is turned on in G Suite, then click App Management. Step 7: Click to open your settings (three dots located in the upper right-hand corner), then click Add custom app from the drop-down. Step 9: Click User settings for the new app. Step 10: Under User settings, click your top-level domain to edit the App settings for users at that domain. You can also choose only specific groups you want to force the PAB Chrome extension to, depending on if you've set up groups in G Suite. 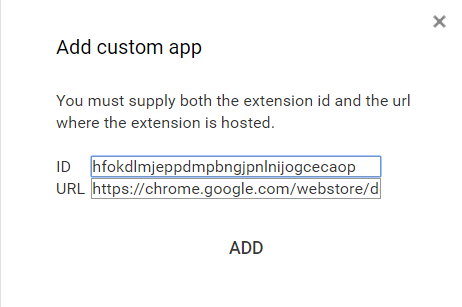 Step 11: Turn on Force Installation for the domain you selected, or your selected organizational units (OUs) -- this will prompt your users (on their next Chrome restart) with a pop-up to allow the PAB to be added. Ensure you inform your users you'll be installing the PAB Extension so they know to approve the install. Step 12: Upload your Configuration file (phish_alert_configuration.json). This is the file located in your KnowBe4 Account Settings that you downloaded in Step 1. 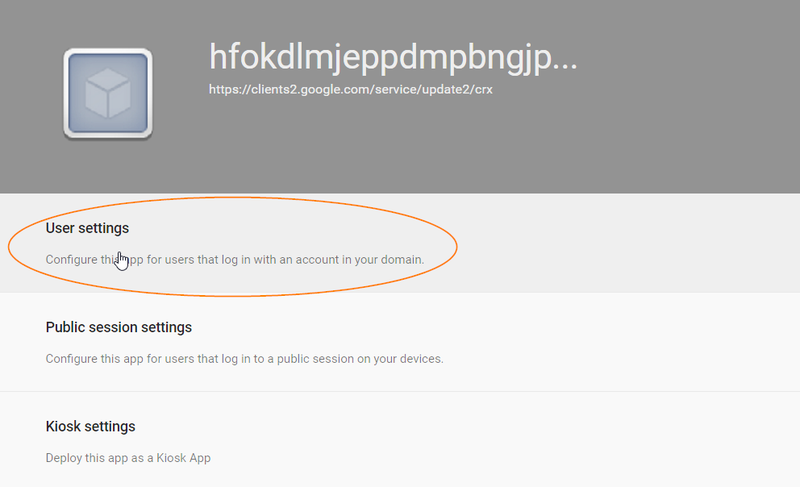 Step 1: Ensure you're logged in as an admin to your organization's Google Apps/G Suite account. When you're in Gmail, you can click the top-right button (shown below) to access your Admin area. Step 2: Click the Admin icon to access your G Suite Admin area. Step 3: Click Device Management. Step 4: Click Chrome Management. Step 5: Click App Management. Step 6: Hover over the app icon to the left of the PAB Extension ID (hfokdlmjeppdmpbngjpnlnijogcecaop). Step 7: Check the box that appears. Step 8: Click on settings (the three dots) in the top-right corner. Step 9: Select Remove app(s). Once the PAB add-in is installed, upon their next Chrome restart, your users will be prompted with a pop-up message to "Allow" the KnowBe4 PAB app. They must click "Allow" on this pop-up message. After allowing the PAB app, your users will see the PAB as an orange Phish Hook within Gmail. A user can use the Phish Hook to report any email as a phishing email. The reported email will be in the user's Sent Items as a forwarded message and will be deleted from the user's Inbox. If the user incorrectly reported the email, they can retrieve it from their Deleted items/Trash. Users cannot use the PAB to report multiple emails at once. Each potential phishing email should be reported individually. However, if an email has multiple emails associated with it, ALL of the emails will be reported when you report the single email. To instruct your users on how to use the PAB, you can provide our How Do I Use the Phish Alert Button in Gmail? article. How Do I Use the Phish Alert Button in Gmail?